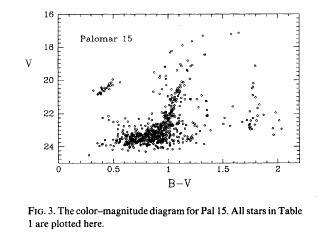 Palomar 15 was discovered by Zwicky (1959), who claimed it contained about 400 star with 19 < m < 22. Kinman and Rosino (1961) obtained nine deep plates (limiting m around 22), and counted 150 stars within a 4.2' radius, and found no variables. The cluster was ignored until recently, when both the authors and Harris and ban den Bergh (1983) decided to study it in more detail... the cluster apparently has an unusually large core radius, the largest, in fact, of any globular cluster. This alone makes it dinamically interesting. Its large tidal radius, on the other hand, suggests it has never strayed close to the Galactic center, where tidal forces would easily dismember it. Seitzer, Patrick; Carney, Bruce W.
Peterson, Ruth C.; Latham, David W.